TriSulfa is a specially compounded broad-spectrum antibiotic for use in both freshwater and saltwater aquariums consisting of sodium sulfathiazole, sodium sulfamethanzine, and sodium sulfacetamide. TriSulfa treats both gram positive and gram-negative infections in ornamental fish. TriSulfa is also effective for preventing secondary bacterial infections from developing when fish are attacked by parasites. For infections of: Fin and tail rot, Gill Disease, Popeye, and secondary infections. 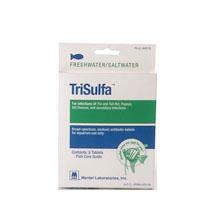 Indications: TriSulfa is a high potency tablet for control of common bacterial diseases in fresh and saltwater fish. It is used for external infections of fin and tail rot, gill disease, and popeye. TriSulfa should also be used to prevent secondary infections from developing when treating for parasites. Administration and Dosage: TriSulfa tablets should be dropped into the tank (not into the filter). 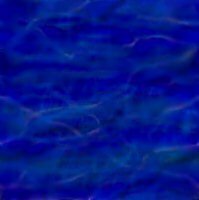 The tablets dissolve rapidly and circulate through the water. A dosage of one tablet per ten (10) gallons (37.85 liters) of water is recommended. TriSulfa tablets can be used with Coppersafe and MarOxy. Refer to the diagnostic flowchart for proper combination use. Precautions: Any sudden change in aquarium conditions can be hazardous. Make changes gradually. Do not overdose. Keep out of reach of children. For aquarium use only. This product is intended for the exclusive use with ornamental ifsh and/or other ornamental orgaisms and is not intended for use with fish for human consumption. Active Ingredients: Each tablet contains 400 mg sodium sulfathiazole, 100 mg sodium sulfamethazine, and 100 mg sodium sulfacetamide. Notes from Mardel on biological filtration: "Nitrobacter and Nitrosomonas are recognized as the primary beneficial bacteria present in the biological filtration system of any aquarium. Some drugs which treat fish diseases and parasitic infestations are harmful to these 'good' bacteria. When the biological filter is upset, there is a buildup of ammonia and nitrite concentrations resulting in fish distress and death. Mardel products have been tested with known strains of these bacteria with no adverse effects noted. When used as directed, they do not interfere with the biological filter." Maracyn is a trademark of Mardel Labs, Inc.